With the brilliant color of this bracelet, you will have an outstanding look which will make everybody jealous. 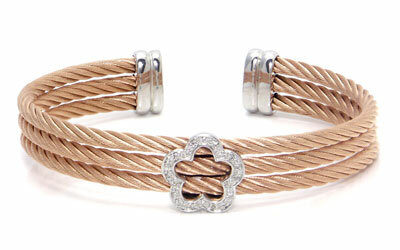 The bracelet has triple layers of the rose gold cable ropes. Beside that, this splendid bracelet has a small decoration too, which is the shape of a clover flower, placed in the middle of the bracelet. This sweet-looking flower carries the shiny diamonds, creating a first-class design on you.